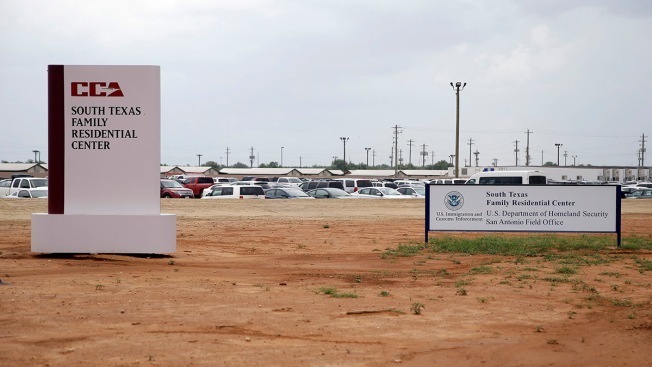 In this June 30, 2015, file photo, signs are seen at the entrance to the South Texas Family Residential Center in Dilley, Texas. The mother of a toddler who died weeks after being released from the nation's largest family detention center has filed a legal claim seeking $60 million from the U.S. government for the child's death. Juarez's lawyers say Mariee developed a respiratory illness while she and her mother were detained at the South Texas Family Residential Center in Dilley, Texas. They accuse U.S. Immigration and Customs Enforcement of releasing the pair while Mariee was still sick. Washington-based law firm Arnold & Porter says it will file a lawsuit if the government doesn't settle its claim. A spokesman for U.S. Customs and Border Protection says the agency wouldn't comment on pending litigation. Other agencies didn't immediately respond to messages.